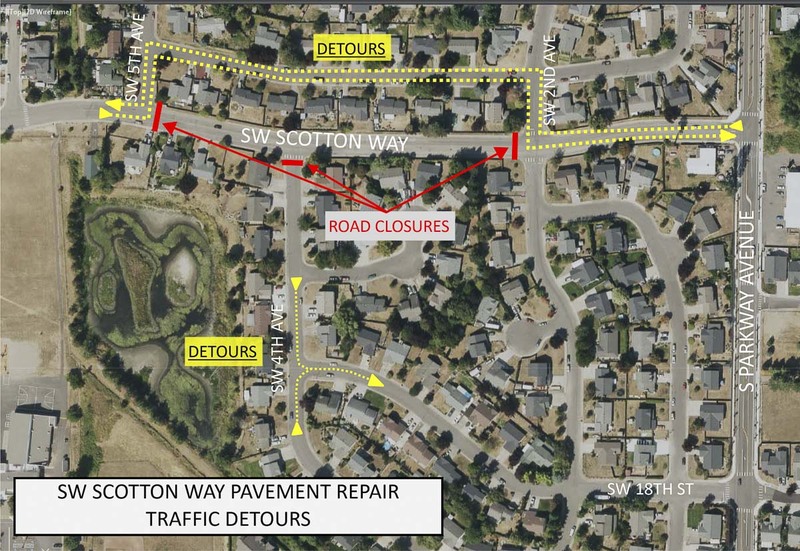 BATTLE GROUND — SW Scotton Way in Battle Ground, between SW 2nd and SW 5th Avenues, will close to traffic on Tue., March 19 and Wed., March 20 as crews work to make repairs to the pavement. Sections of the roadway have developed deep potholes and crumbling asphalt. The repair work will focus on the most damaged areas by removing the asphalt layer and replacing it with new asphalt. The work is funded by Transportation Benefit District (TBD) revenue. The city is actively seeking grant funding for a more permanent fix to the entire length of the roadway between SW 9th Ave and Parkway. Detour signs will be in place – see a map of the road closure and detours (https://www.cityofbg.org/DocumentCenter/View/6017/SW-Scotton-Way-Road-Closure–March-19–20-2019?bidId=). Motorists should take caution as they travel through the area. Information provided by city of Battle Ground.